TYPO3 provides an API class for creating so-called 'Feature Toggles'. Feature toggles provide an easy way to add new implementations of features next to their legacy version. By using a feature toggle, the integrator or site admin can decide when to switch to the new feature. The API checks against a system-wide option array within $GLOBALS['TYPO3_CONF_VARS']['SYS']['features'] which an integrator or admin can set in the LocalConfiguration.php file. 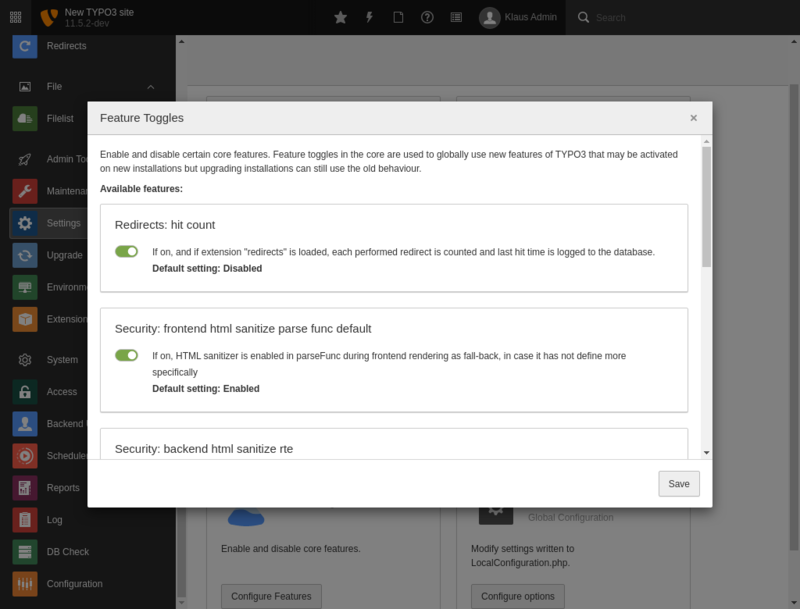 Both TYPO3 Core and Extensions can provide alternative functionality for a certain feature. Throw exceptions in new code instead of just returning a string message as error message. Disable obsolete functionality which might still be used, but slows down the system. Enable alternative PageNotFound handling for an installation. Feature names should NEVER be named "enable" or have a negation, or contain versions or years. The name can be any arbitrary string, but an extension author should prefix the feature with the extension name as the features are global switches which otherwise might lead to naming conflicts. TypoScript.strictSyntax: If on, TypoScript is parsed in strict syntax modes. Enabling this feature means old condition syntax (which is deprecated) will trigger deprecation messages.